–A tarantula crawls across Ms. Slavnic’s arm during school this week. 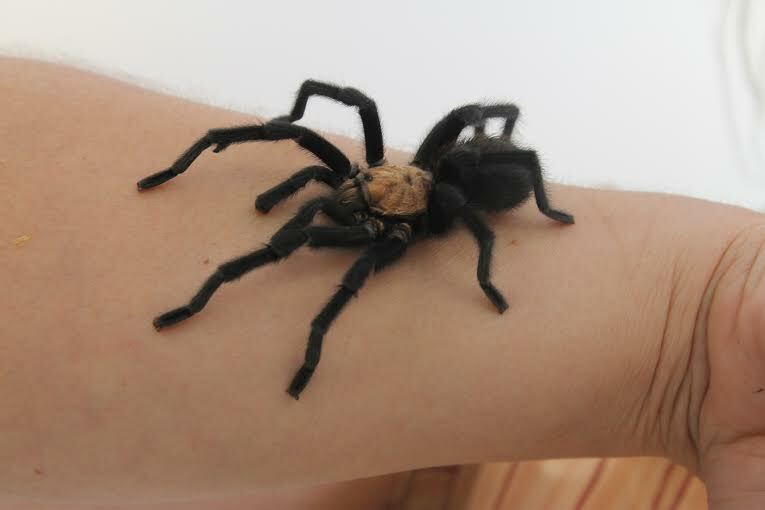 Slavnic has adopted the tarantula, originally found in a scholar’s yard. Project manager Emina Slavnic added a furry friend to her classroom this week. While not typically a lover of spiders, she said that when scholar Elizabeth Flory brought in a tarantula found outside her home, Slavnic took the tarantula in and made it a class pet. The tarantula has been identified as a male, having hooks on its legs, and its diet consists of crickets and worms. “Pretty much anything that’s smaller than him he’ll eat it,” Slavnic said. She plans to feed him once a month. She has him housed in a see-through container containing sand, a rock, and a water bowl, which was provided by Flory’s family. “I’m hoping to get a water sponge for him so it’ll be easier to handle him,” she said. The tarantula remains nameless, thus far. “Some (scholars) want to name him Buttons. I was thinking about naming him Copper since that’s the color on his back,” Slavnic said. She has not been bitten yet, and says that he’s perfectly harmless. “Even if he did bite me, I probably wouldn’t know,” she joked.